This page is about the aircraft F2A-3. For other uses, see F2A (Family). The F2A-3 Buffalo is a Rank I American fighter with a battle rating of 2.7 (AB/RB) and 2.3 (SB). It was in the game since the start of the Open Beta Test prior to Update 1.29. 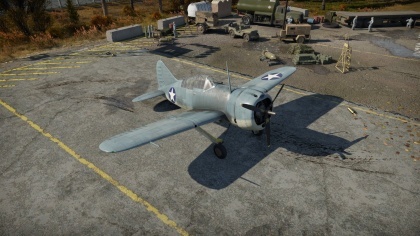 The F2A-3 Buffalo gives pilots the first real taste of typical American fighters in War Thunder- a lumbering, well-armored beast of a fighter that is well armed and has decent performance capabilities. Indeed, the second Buffalo in War Thunder is a heavy aircraft for its rank, signifying that its turning ability is underwhelming against the sharp turners it meets, especially regarding its relatively low BR- it will face low-rank Zeroes as well as more nimble German Bf 109's. Due to its 4 machine guns the F2A-3 Buffalo is not very good in dogfight with British or German aircraft. The characteristics of the F2A-3 means that its pilots shouldn't try to turn-fight their opponents and that they should also strictly maintain their energy. However, this weight and energy retention ability means that any Buffalo pilot that cares to climb high- 3,000-4,000 m - will be able to combat opponents with relative ease. However, they should be wary of adept climbers (such as Bf 109s and the US's own P-47, at least in Arcade) as they are more than a match for the F2A's climb rate. In a dive, the Buffalo can rapidly catch up to virtually anything it faces, and, when it does, a battery of 4 x .50 calibre machine guns will make short work of any target, save well-armoured bombers such as the B-25 or Ju 88, which an F2A pilot will probably rarely meet. Discipline is a vital trait needed to master this plane. If you are used to simply engaging with the first opponent you find and turn-fighting, the F2A is not for you, as is much of the US fighter line. The recommended tactic to use with the F2A is Boom & Zoom. 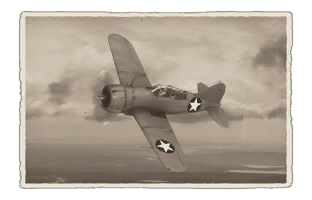 At the beginning of the battle, it is vital to climbing- not climbing reduces your energy capabilities drastically due to the low-level flight speed of the F2A- climbing significantly exacerbates performance of the F2A due to its weight and diving capabilities. After attempting a diving engagement on an enemy, whether successful or not, one should always pull out of the engagement shortly after the first attacking pass, as not to waste speed and/or altitude (a.k.a. energy). Four M2 Browning .50 MGs are plenty for a 2.7 BR plane- the heavy bullets rip through almost all fighters at this rank. Omni and Stealth rounds are the most effective belts- the Stealth being especially effective due to the M8 API bullets which allow F2A pilots to easily set your opponents afire. Against bombers, the capabilities of the M2s are greatly reduced- aiming for engines is the most effective way to combat a bomber. You should always use the boom and zoom tactic as it suites well for Japanese fighters at its rank. However, Japanese fighters will out turn you. For firepower modules, outside of upgrades for the machine guns, the unlock of the module Mk.41 will allow the F2A-3 to mount two 100 lb AN-M30A1 bombs. Great stealth armament. It takes time to get used stealth ammo, but once you learn its ballistics, F2A-3 become deadly machine.